to Headstone Manor & Museum. Celebrate Halloween in style with our annual, family friendly, Halloween Spooktacular event inside our 500-year-old Great Barn! 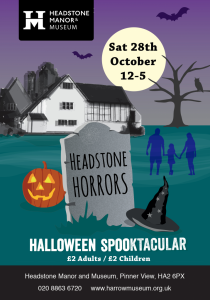 Come along and enjoy an array of FREE themed children’s activities including Spooky Storytelling, (Un) Lucky Dip, meet a friendly Witch, Potty Potion Brewing, Headstone Trail Hunt and lots more make and take activities. It will be a barrel of laughs (or squeals)! Get in the spooky spirit and dress up to receive a free edible eyeball on entry! Parents are encouraged to embrace the day and dress up too, accumulating in a prize for best dressed parent. Take a stroll through the historic Great Barn where you will find an array of artisan stalls including Frightening Face painting, Cursed (but tasty) Cup Cakes, and other thrilling treats. It proves to be a spooktacular day for the whole family and offers a perfect alternative to trick or treating for the little ones. Entry is only £2 per person and can be purchased on the day at the entry gates. Gates open at 12pm and the event will finish at 5pm.